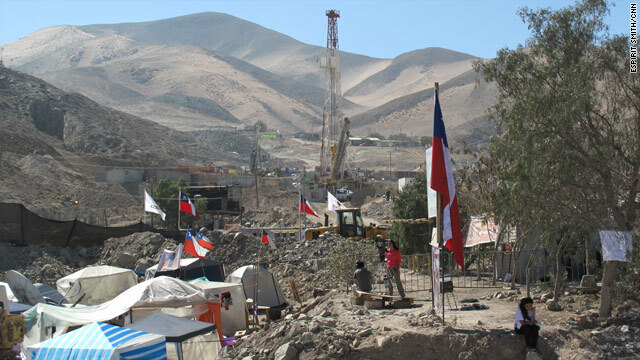 Camps have been set up in the Chilean desert, where three different rescue shafts are under way. Copiapo, Chile (CNN) -- Chile's mining minister expressed optimism Thursday that the 33 miners trapped since early last month 2,300 feet (701 meters) below ground here will be rescued in early November and maybe sooner. "Everything is going a little bit better than anticipated," Laurence Golborne told CNN about the three holes -- dubbed Plan A, Plan B, and Plan C -- being dug in an effort to open a passageway to safety for the men. "On Plan A we didn't have to change the drill bit at 200 meters [656 feet] but instead we were able to drill and change it at 320 meters [1,050 feet]," he said. "Plan B today reached 500 meters [1,640 feet] and we're reaching 700 meters [2,296 feet] probably by this weekend. "We have finished assembly of the Plan C drill and that will be ready to start operating over the next couple of days possibly this weekend." He added, "So, we're optimistic we will comply with our target date at the beginning of November and, if everything stays on path and we have no big problems, then it could be earlier." Plan A and Plan B each require two holes to be drilled -- a small hole first and then a wider one about 26 to 28 inches (65-70 centimeters) in diameter. Golborne said the second pass would be slower progress than the first pass. "It's like eating a donut," he said. "What we are doing first is eating a little bit a around the hole in the middle of the donut and then we have to eat the rest of the donut and that is slower." Drilling under Plan A will stop this weekend once the drill bit reaches 1,247 feet (380 meters), then the drill will receive scheduled maintenance before resuming early next week, engineer Rene Aguilar said. According to Golborne, the first stage of drilling on Plan B has reached a depth of 1,640 feet (500 meters) and will pierce the ceiling of the mine shaft where the men are trapped this weekend. The assembly of the drill to be used in Plan C has been completed, he said, adding that he hoped it would begin drilling this weekend. Plan A involves using a drill placed directly above the shelter where the miners are holed up. Engineers estimated last week that this plan would take between three and four months to complete the hole at 701 meters (2,300 feet). Under Plan B, a hole is being drilled at a roughly 80-degree angle into an area of the mine shaft that is used as a mechanical workshop. That distance, engineers estimate, is around 2,034 feet (620 meters). The drill used in Plan C would need to cut through some 1,969 feet (600 meters) of rock and earth, they said. Golborne said rescue workers were betting which plan would rescue the miners. "Between our teams members we are betting one another a barbecue, but I won't tell you which one I'm betting on. But no matter which plan wins, I will be very happy if we can have them back as soon as possible." Two bore holes -- each about 8 centimeters in diameter -- are currently being used to supply the miners. The first carries compressed air, water, communications and a constant supply of electricity to power lights that are intended to simulate daytime and nighttime. Supplies -- such as food, clothing and letters -- are sent down to the miners via metal cylinders known as "carrier pigeons" through the second bore hole. Golborne said the miners' pay was being distributed to their families from the mutual security system. "And in the future, due to their heroism, they will probably be welcome to work anywhere," he said. The company has continued "for now" to pay the salaries of some 300 other mine employees who have not been working since the August 5 cave-in, he said. "We have to see in the future but we, as the government, are prepared to give them the right support, and to help them in the process to defend their rights and to help them find jobs on the future," he said. Two prototypes of cages to be used to hoist the men to the surface will be reviewed Tuesday as will the design of the winch, Golborne said. He predicted the cage that is used will have a diameter of 55 centimeters (21.7 inches) to 60 centimeters (23.6 inches) and will be pulled upward at a rate of one meter per second, meaning each man could make the trip in 10 to 12 minutes. Previous estimates had suggested it could take 2-1/2 hours to hoist and then lower the cage,. Asked whether new laws were needed to enforce mining codes, Golborne said the laws were not to blame for the men's predicament: "The problem was that the owners did not do what they were told to," he said. "Not because it was too expensive or they were greedy, but just because they didn't care. ... we have got good regulations but maybe we need to improve auditing of those regulations." Representatives of the owner, the San Esteban Mining Co., have said previously they will collaborate fully with Chilean authorities and the Chilean Congress in their inquiries about what went wrong at the mine. CNN's Patrick Oppmann and Esprit Smith contributed to this story. CNN's Karl Penhaul examines 24 hours in the lives of the trapped Chilean miners.